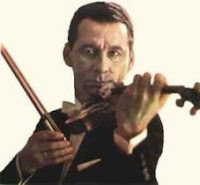 Ion Voicu was a Romanian violinist born on October 8, 1923 (Heifetz was 22 years old.) He began violin lessons at age six, with Constantin Niculescu. He was later admitted to the Royal Academy of Music in Bucharest, managing to graduate in just three years. In 1946, he won a first prize in a national competition which Yehudi Menuhin organized. Beginning in 1949, Voicu made several tours with the George Enesco Philharmonic. In 1954, Voicu pursued further studies with Abram Yampolsky and David Oistrakh in Russia at the Moscow Conservatory. Voicu made his British debut in 1963 and his U.S. debut in 1965 at Carnegie Hall. He toured the U.S. under the management of Sol Hurok, an important impresario in those days. Voicu concertized on an international scale from then on. He also founded the Bucharest Chamber orchestra in 1969. Later on, he devoted time to teaching at the Mozarteum (Austria), in France, and in Switzerland, among other places. His discography includes more than 100 recordings and YouTube also has a few videos of his playing. Voicu died on February 24, 1997, in Bucharest.